The Commons Brewery in Southeast Portland opened nearly a year ago and will soon celebrate its first anniversary. I first visited early on and I stopped by several times since. 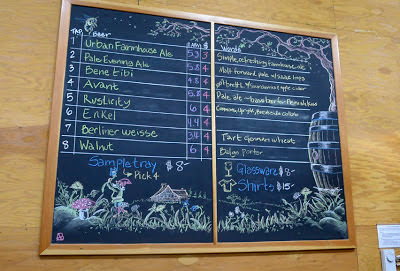 My initial post on this brewery is here, if you're interested. The Commons has certainly built its brand presence around town. They conduct tastings all over the place and bottles are available at many finer stores and bottleshops. Their beers can also be found on draft in more and more places. These are Belgian-influenced beers. As I said the first time around, they don't brew or pour your standard beers here. There's no IPA on tap. No PBR, either. You get the idea. These guys continue to expand their line of beers. On my visit the other night, the only beer I remembered from earlier visits was the Urban Farmhouse Ale, likely their best-known beer. All of the beers on the board were low-octane. The very tart Berliner weisse came in at just 3.4% and ABV topped out at 6% for the list. It's quite amazing that beers with so much character can come in such a low alcohol form. The beer that really grabbed me this time was Rusticity. This stuff is a collaboration between The Commons, Breakside Brewing and Upright Brewing, evidently brewed for the recent Killer Beerfest. Rusticity is fairly dark and mildly tart, with hints of cherries. It's a blend of two rye beers...a Belgian rye stout and Breakside's Six, both barrel-aged. This is a brilliant beer worth searching out if you haven't already tasted it. I suspect it's in short supply. 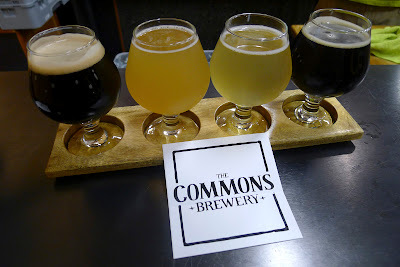 One of the things that's happened at The Commons as they've ratcheted up operations is there is less space available in the tasting room. Why? Because the complement of oak barrels has roughly doubled since they opened to the pubic a year ago. That's a guess. 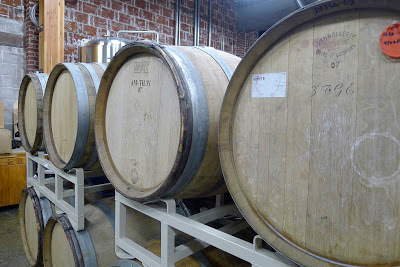 The additional barrels suggest things are going well. Word is, they will soon be occupying some additional space in their building to store bottles, kegs, and related tools of the trade. Currently, this stuff sits out in the main hall when they're open for business and is schlepped back into the brewery/tasting room when they aren't. The additional space will surely be welcome. Given the success they've had, I was wondering when they would expand tasting room hours. Until recently, they were open Friday evening and Saturday afternoon/evening. That seemed a bit constrained to me, but I realize they were taking it slow. Now, they've expanded the hours to Thursday evening, 5-9 p.m. That ought to make it a little easier for folks to stop in and experience these well-crafted beers. Finally, there's a possibility they will be putting together some sort of event to celebrate their first anniversary in early December. No word on when or what the event might look like. Watch for social media updates or check their website for information. Love that Rusticity! Sorry we didn't connect when you were in town. I will certainly have to get over there to visit this weekend to try the Rusticity if they still have it. Being Belgian-averse for the most part they continue to surprise and delight me at nearly every turn. I'm always interested in trying the next new thing they put on tap even if the style or description isn't something I'm sure I'll like.